Ceiling Air Conditioning units / Heat Pumps are made up from two main components - an evaporator fitted internally and a condenser placed outside. The internal unit of the office air conditioning / heat pump is sunken into the false ceiling by removing a single or 4 ceiling tiles and hung from the ceiling above. 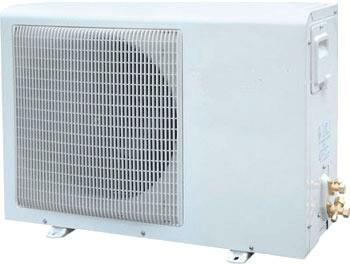 The office air conditioning external unit is situated outside the building, and can be wall mounted on brackets, or placed at ground level or on a flat roof. Copper pipe runs between the cassette air con unit and the outdoor condenser, refrigerant gas runs through these pipes and transfers the heat from inside the room to outside, it also pumps any excess condensation in the room away, making an air conditioning unit a dehumidifier at the same time. Ceiling Cassette Air conditioning units are the most popular form of air conditioning in offices as they can be mounted centrally in a room, allowing for the most even distribution of air across the whole room, especially when there are no walls to mount an air conditioner on in the centre of the office. Our slim cassette air conditioning units will fit into the smallest of ceiling voids, with some of our unitsonly 230mm deep. Noise from these units is not a problem, with levels as low as 38Db our ceiling air conditioning units will not be noticed even in the quietest of office conditions. All of our cassette air con units use the latest eco-friendly R410a gas, this is non ozone depleting and used widely in almost every air conditioning unit in the world. We also have an inverter type ceiling air conditioning unit, inverter technology is becoming more important in the world of air conditioning, costing more to buy but saving money in the long run, they are suited for offices where air conditioning is required for a prolonged period every day.